What is a DELTA Grant? DELTA Grants support the creation of online courses, explore new technologies for teaching, seed new online programs, assist in the redesign of blended and face-to-face courses, and enhance and update older online courses. These grants are part of a competitive awards program and include Online and Distance Education (ODE), Blended Learning, Exploratory, Critical Path (CP), Rapid Design (RD) and Faculty Fellows grants. DELTA Grants promote innovation in the use of instructional technology in online and distance education teaching and learning by providing support in the form of DELTA personnel hours and funds. With the grants, we seek to cultivate instructional excellence in online instruction through experimentation with new ideas, teaching methods and technologies. What is DELTA looking for in these grants? DELTA especially encourages projects that serve the needs of significant numbers of potential students and are consistent with department and college initiatives. DELTA also encourages projects that yield materials which can be used in on-campus courses or extension activities in addition to their intended online and distance education usage. Is an online course different than a distance education (DE) course? Yes. An online course uses online materials to supplement or replace face-to-face activities. An online course can be an on-campus course or a distance education course. A distance education course (which usually has a 6xx section number) is a course administered by DELTA’s Online and Distance Education unit, and can use web materials, video materials or other means to distribute content and facilitate learning activities. I already teach a Distance Education course. Am I eligible for a DELTA Grant for that course? If you want to substantially modify, revise or expand your course with new materials, or if you plan to create a new resource for teaching that course, then you can apply for a DELTA Grant. I didn’t get funded when I last submitted an application. Can I reapply? Are there limits on the number of grants awarded in each category? No. Each year, DELTA receives a mix of proposals across the grant categories. The number of grants awarded in each category will depend on the total number of proposals, quality of proposals, amount of funds and DELTA staff time available, and other standard review criteria. Based on grant awards from previous years and the resources we expect to have available, we do have approximate expectations of the number of grants that will be awarded in each category. Approximately how much time will it take to create a DELTA Grant proposal? The answer will vary with each proposal depending on the complexity of the grant and the information you will need to gather. We work to keep the application process for a DELTA Grant simple and streamlined. Having strong support from your department or unit, your college and/or within DELTA will increase a proposal’s chances for success. Because proposals benefit from departmental and college support, you should factor in meeting times with your department head and with your college’s distance education coordinator. You may also wish to Attend a Group Consult and Information Session, which usually last about an hour. The estimated time for compiling and preparing a strong proposal, therefore, is approximately 5 – 20 hours over a period of several weeks. Who do I contact if I have questions about DELTA Grants? Please email deltagrants@ncsu.edu with any questions. Who is eligible for a DELTA Grant? Any member of the NC State faculty or staff may submit proposals. Certain grants require applicants to possess some experience teaching the course to which the proposal applies. Specific eligibility guidelines are outlined in the Request for Proposals (RFP). Can a graduate student apply for a DELTA Grant? Yes. However, since part of the grant review criteria emphasizes reusability, we will consider how long a graduate student’s project will continue to be used. The grant application will likely be stronger with a faculty or staff member as the principal investigator. Can these awards be used to develop programs for practicing NC professionals in need of Continuing Education credits licensure renewal by their governing boards? At this time, DELTA Grants are only available to develop of for-credit online and distance education courses and programs. In some instances, course materials can be cross-purposed for use in for-credit and non-credit courses; in those cases, we can support the development of materials whose primary purpose is online and distance education. What if I don’t receive a grant? DELTA receives many great proposals in each cycle, but unfortunately, we lack the resources to support them all. We encourage applicants to reapply the following year, especially after receiving feedback from DELTA about making the proposal stronger. In addition, the Instructional Services unit of DELTA offers assistance to faculty through workshops, instructional consultations on instructional technology issues, and limited production support for instructional materials. 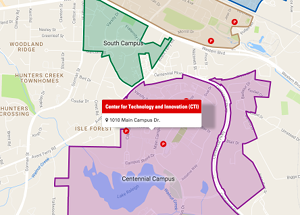 Contact DELTA Instructional Support Services staff via learntech@ncsu.edu. The submission form asks for information about other resources that support my project. What if my project is already being supported in other ways? If your project is currently supported in other ways, it’s not necessarily a problem. If the different resources are complementary and help you finish a large project, that is appropriate. However, we do not want to support a phase of your development that another mechanism is already supporting. Does my department review my proposal? Yes. As the last stage of the proposal submission process, your department head will review your proposal. In this review, they can accept or deny the proposal and can add their comments or endorsements. Your department head must accept the proposal in order for your submission to be complete. This review must be completed by the proposal submission deadline, so you should consider contacting your department head prior to the deadline.The goal of the department review is to ensure that the proposal is consistent with departmental objectives, that the proposal is feasible given faculty activities, commitments and responsibilities, and that the proposal will be supported by departmental resources after the DELTA Grant is over. Does my college review my proposal? College deans or their designees review all proposals submitted by faculty or staff in their college except for Faculty Fellows grants. They score and rank the proposals and can also add comments or endorsements. The goal of the college review is to ensure the proposal is consistent with college priorities, that the proposal is significant to the college’s strategic initiatives and that the proposal strengthens related activities in the college. What is the process for internal review at DELTA? During the DELTA internal review process, DELTA personnel review proposals for their potential to strategically impact online and distance education programs or the general distance education environment at NC State. The reviews by the departments and colleges are also taken into consideration at this time. At any time in the review process, DELTA staff may contact you for more information about your project. DELTA review criteria for different grant categories are available in the Request for Proposals. What is the importance of the college review versus the DELTA review? The college scores and comments are a very important part of the process, and we take them seriously. However, other considerations also factor into the review process. For example, a proposal may be in-line with college and department objectives, but DELTA lacks the necessary technical resources to support development. Alternatively, a proposal that finds less enthusiasm from the college may still get funded because it will increase online and distance education enrollments and require very little support for success. How will I be notified about the status of my grant? DELTA notifies colleges and faculty about the awards via email. Dr. Tom Miller, vice provost of DELTA, contacts each college dean to discuss the proposals that have been selected for awards. Explanations are provided for all proposals that were ranked inconsistently with college scores, and each faculty member receives a customized email notice indicating whether the proposal was accepted or denied. No, you may not pay graduate student tuition with state-appropriated funds. If you are simply hiring an individual as a temporary employee paid on an hourly basis, you do not need to be concerned about a slot, even if they also happen to be a graduate student. However, if you are using these funds as part of a formal graduate assistantship, then you will need to be concerned about the Graduate Student Support Plans (GSSP). If your department/college has an available slot, it would be appropriate to use the funds from your DELTA Grant for the actual monthly assistantship payments during this fiscal year and use the slot for the GSSP. Should I plan to complete my project in a single year, or are multi-year projects accepted? You should plan to complete your project in a single year. In cases where further support is necessary, you should consult with DELTA staff to consider options for continuing support. Can I carry unspent DELTA Grant funds forward into the next fiscal year? DELTA Grant funds are state-appropriated funds transferred to a department on a fiscal-year basis with the intention of those funds being expended that fiscal year. Once transferred, these funds are subject to rules and procedures within your department and college. If the college should receive exceptional approval from the university to carry forward state-appropriated funds into the next fiscal year, it is possible that this approval could include distance education funds. If an exception is granted by the university, please be sure to work closely with DELTA to extend the proposed completion date of the grant. Who should I contact to determine if the funds awarded for my grant have been deposited in a distance education project ID in my department? Your college business officer will be notified via email from the DELTA Office of Finance and Business when the transfer of funds has been initiated. Either you or your departmental bookkeeper should work with the Business Officer for your college to ensure that funds are available in the appropriate account codes and ready to be expended. Who am I allowed to pay in my funding requests? TAs? GAs? Others? You may pay monthly employees (EHRA teaching, EHRA non-teaching, SHRA), temporary employees or contractual labor. You may pay for graduate assistantships and associated benefits provided that you have the appropriate department, college and university approval for assistantships; however, you are not allowed to pay tuition. Can I ask for release time, so that my salary is covered? Yes. However, specific agreements regarding release time are internal to your department and/or college. If I don’t spend all of my funding, where does the money go? These are state-appropriated funds transferred to a department/college on a fiscal-year basis with the intention of those funds being expended that fiscal year. Once transferred, these funds are subject to rules and procedures within your department and college. If the college should receive exceptional approval from the university to carry forward state-appropriated funds into the next fiscal year, it is possible that this approval could include online and distance education funds. Requests for carryover must be made through your academic department to the university, as DELTA cannot grant carryover exceptions. If an exception is granted by the university, please be sure to work closely with DELTA to extend the proposed completion date of the grant. How is the money transferred and managed? Is it divided between personnel and operating funds, or can I move items around? The funds are transferred as EHRA Teaching funds or Operating funds. Your college Business Officer will be notified when the transfer of funds has been initiated. You should work with the Business Officer for your college to ensure the funds are moved to the appropriate account codes (personnel and operating) as specified in your budget. The budget flexibility rules which apply to all state-appropriated funds apply to the DELTA Grant funds. If you are not familiar with these rules, your college Business Officer will be able to assist you. What if I’m in a faculty phased retirement status? Before submitting a DELTA Grant proposal, notify the DELTA Grants Program Manager of your phased retirement status to find out if you’re eligible to receive DELTA Grant funding. The State Retirement System monitors this very closely, and you will be penalized by the State Retirement System if you receive additional funds. If you have questions about your eligibility to receive DELTA Grant funding in addition to your negotiated salary, you should contact your department or the University Benefits Office. Who should I contact in DELTA with funding-related questions? Please contact the Assistant Vice Provost, Business Operations for DELTA, Jessie Sova.